KUCHING: New RedONE data subscribers will be entitled to one year’s e-paper subscription of either The Borneo Post, See Hua Daily News, Utusan Borneo or Oriental Daily. 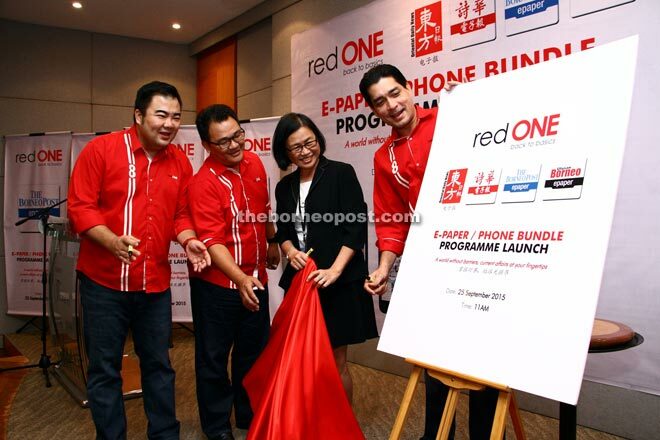 Chief executive officer Farid Yunus said the promotion would be valid for subscription of RedONE’s 3G postpaid data, slated for multiple devices. “Customers can download the e-papers on many devices as long as they have the username and password, and have downloaded the app. This is our partnership with the e-paper that we share our customers, our database. We are targeting 20,000 accounts in six months starting Oct 1,” he said at the official launching of RedONE e-paper/phone bundle yesterday. He said the four papers were chosen because of the wide coverage and high readership not only in Borneo but also in the peninsula. To locate the 1,000 RedONE dealers nationwide, go to www.redONE.com.my. The Borneo Post’s e-paper subscription is priced at RM38 a year for both Sarawak and Sabah editions. Each account is for one PC and two smart devices.